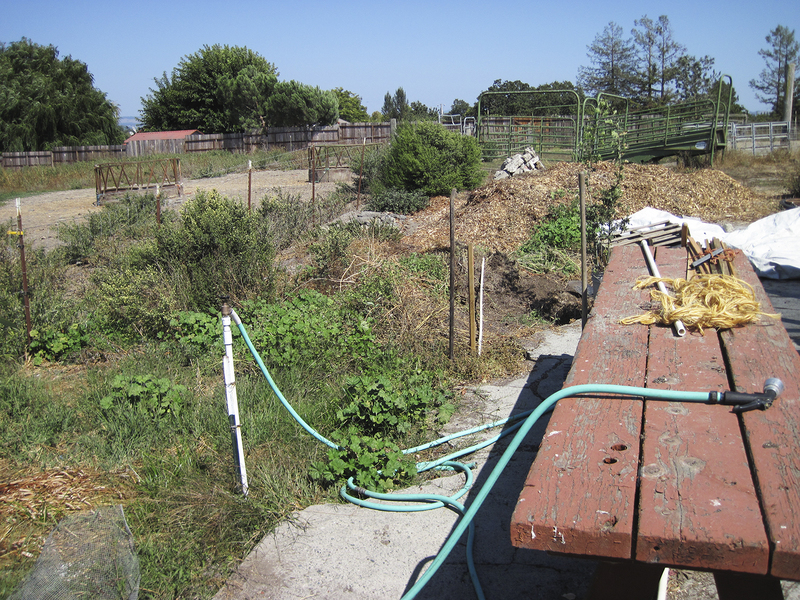 The BEFORE — area behind the Laguna Foundation’s native plant nursery before installation of Compost Cricket Corral, which will consolidate the compost pile and provide wildlife habitat. 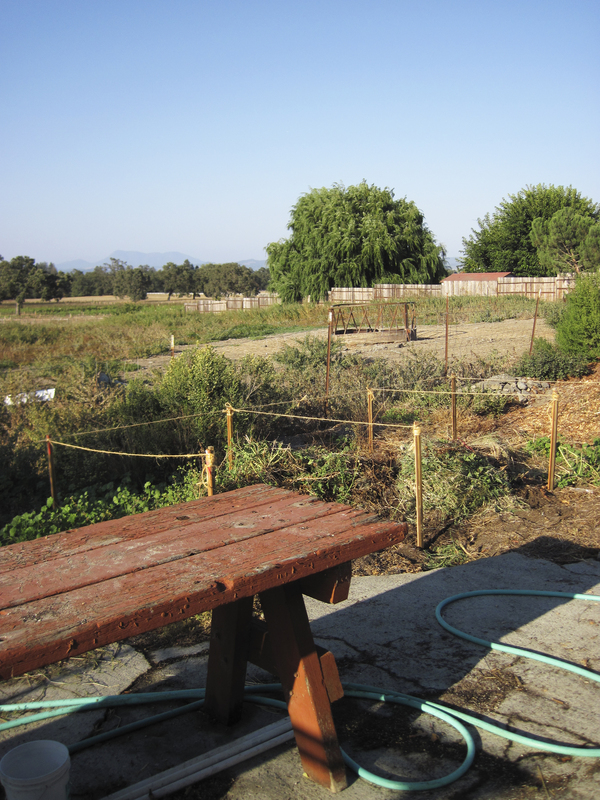 Yesterday, I started prep work for a wildlife habitat installation, Compost Cricket Corral, at the Laguna Environmental Center, which is the headquarters and showcase educational property for the Laguna Foundation. 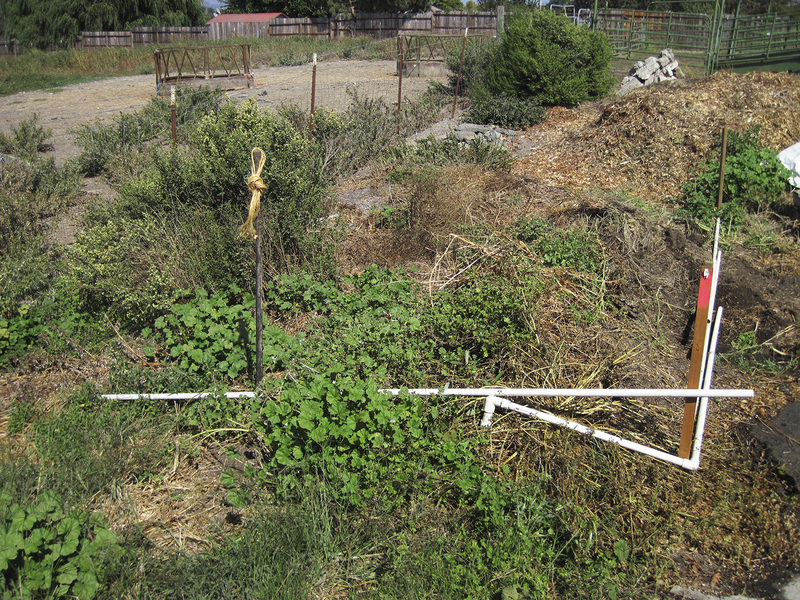 Staking out Compost Cricket Corral’s post locations, which will define three compost piles/bins. No T-square, but piping with a 90-degree elbow worked fine. 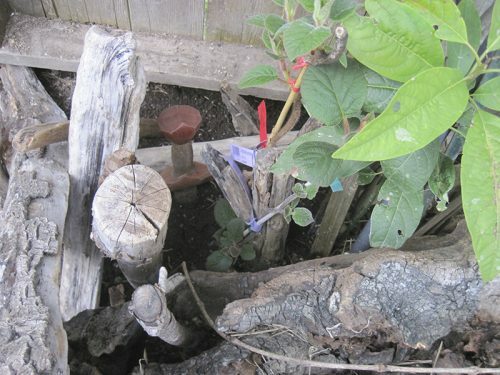 We will be installing vertical driftwood posts to replace the current stakes; the posts are to encourage insect activity. Compost Cricket Corral, that is, the new and improved compost pile(s), will be within easy access of the nursery’s work stations. Stakes mark the pole locations for Compost Cricket Corral. Nice view of Stone Farm’s northern pasture, Irwin creek, and Mount St. Helena while we work! This project will be completed in October by Sunny Galbraith’s biology students from Orchard View School, Sebastopol, California. Compost Cricket Corral will be our first wildlife habitat installation for this school year. Chirp chirp! 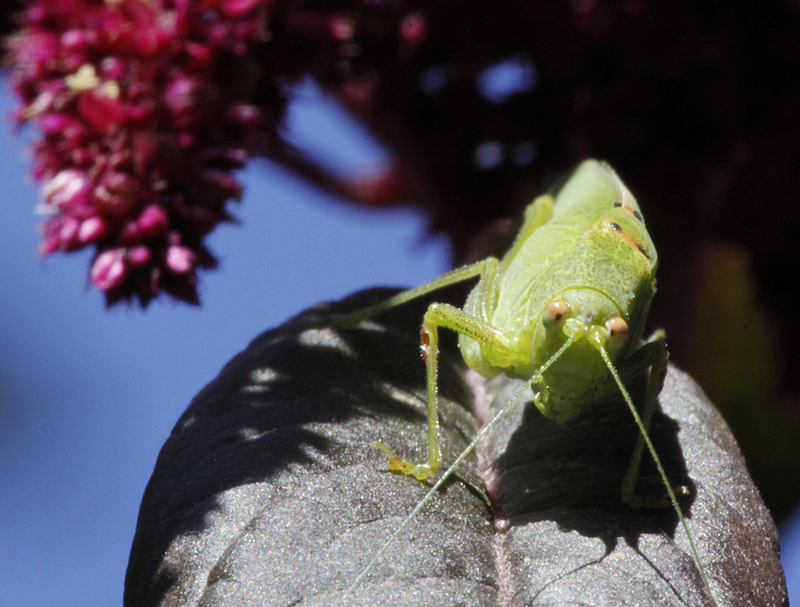 Great Green Bush Cricket on Amaranthus caudatus. Amaranth is an ancient grain. Its family name is Amanthaceae, with nearly 900 species worldwide. 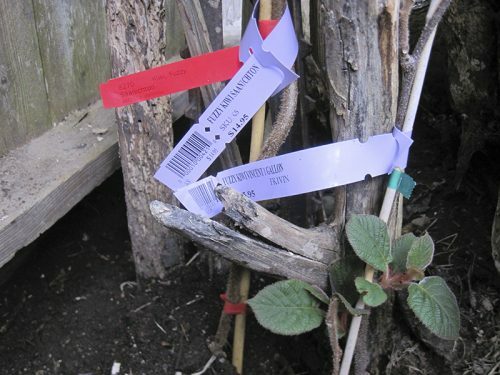 This article focuses on the non-native species Amaranthus caudatus, a species grown by the Aztec Indians of Mexico 8000 years ago, and which has naturalized in my area, Northern California. 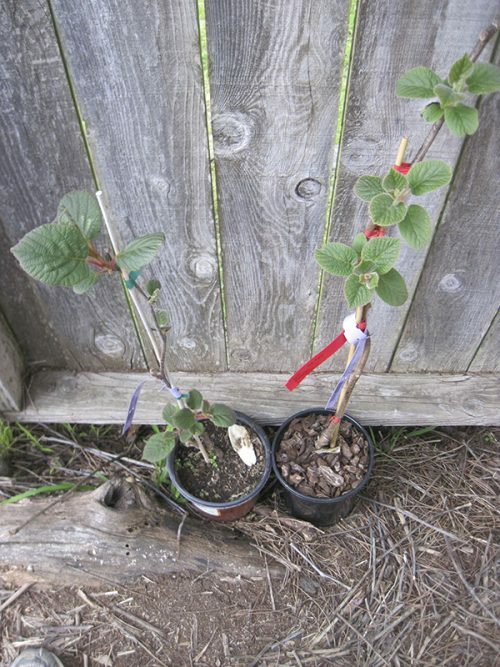 Yes, that the popular amaranth in our garden is not native was a concern to me when considering it as a topic for this blog site. However, I am taking the time to discuss it here because of its generous gift to both humans and wildlife as a food source. 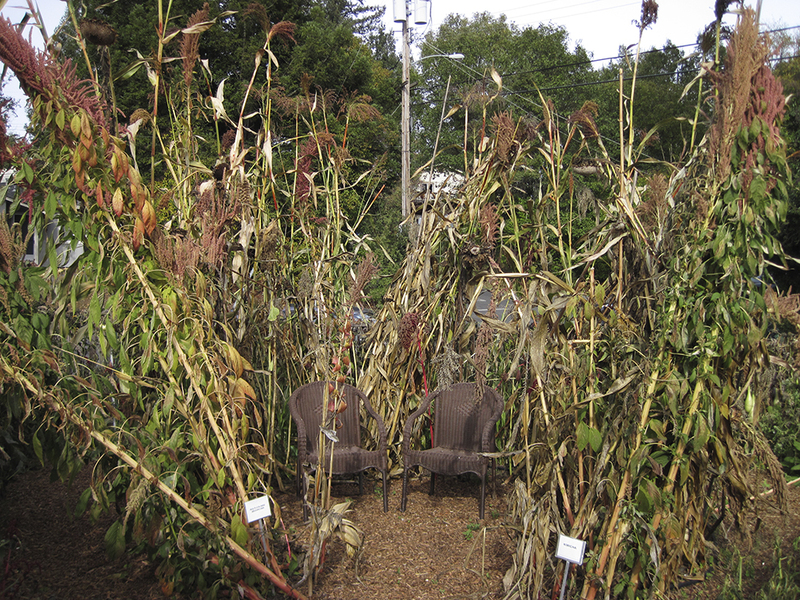 Mature amaranth in the fall surrounds garden seating. Note the pale color of the seed heads — time to harvest seed. Amaranth likes disturbed soils. It gets its common name “pigweed” because it frequently thrives in the disturbed soils of barnyards, especially pig pens. But because there are so many plants commonly referred to as pigweed, I use “amaranth” in this article. Furthermore, I do not use Amaranthus caudatus‘s other common name, “love-lies-bleeding”, because that’s just plain weird! 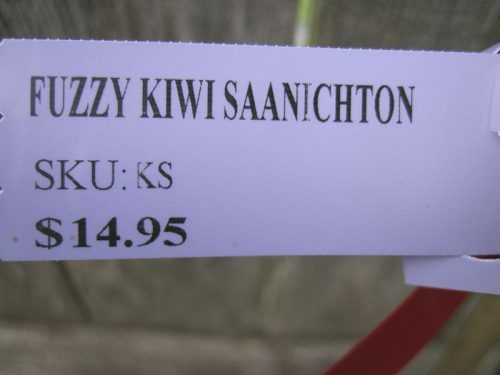 We’ll stick to “amaranth”. Young volunteer amaranth in the author’s garden. 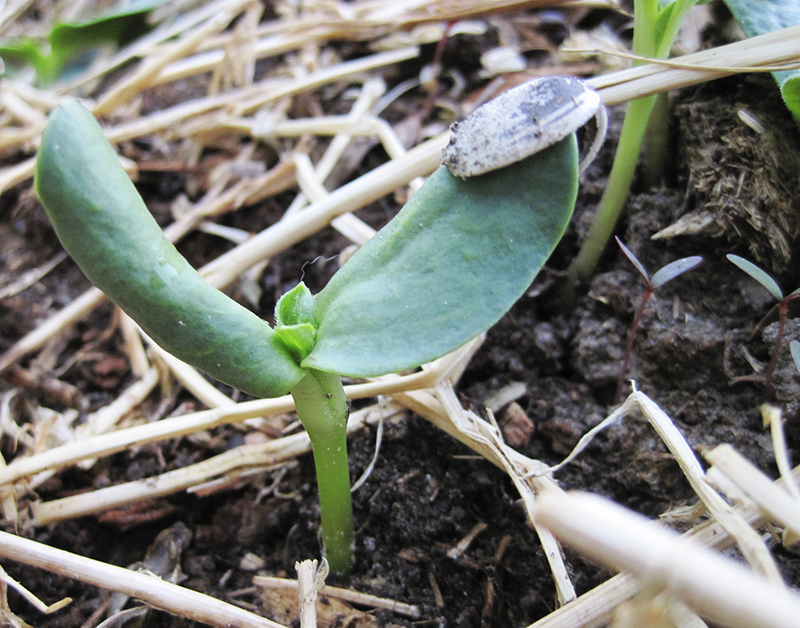 A curious thing happened in our garden recently. We reclaimed a garden bed that had laid fallow– it was an excellent undisturbed wildlife brush pile creating excellent soil!!! The soil was pushed back off off walkway slates and churned into a planting mound. It was disturbed, first time in a couple of years. Up came amaranth, all along the borders of the bed, some on the mound. Yes, there’s cucumber in there somewhere. Young amaranth in the author’s garden competes with dock and rhubarb. The young amaranth leaves have been a delicious salad addition. Tastes a little like soil to me, but I appreciate the not-iceberg-lettuce! hearty flavor. 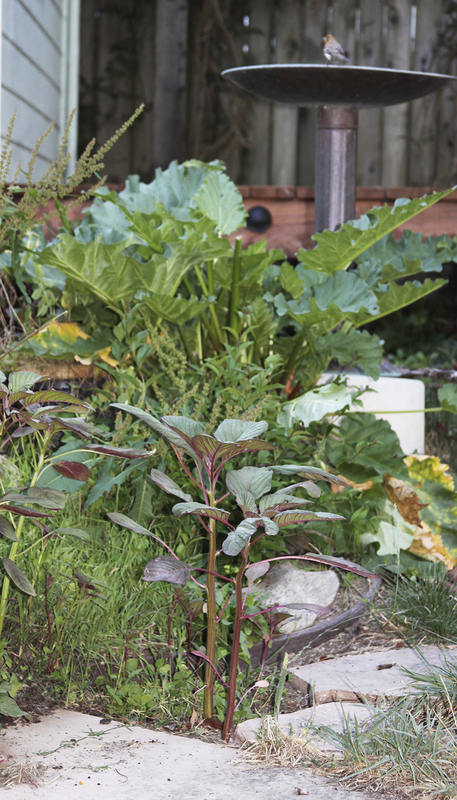 These amaranth (foreground), by fall, will have been thinned, will grow to over 6 feet tall, and will drape luscious tassel-like, seed-rich flowers. Amaranth is considered an insectary plant, and that’s no wonder considering how many zillions (don’t quote me) of flowerlets there are, with each needing to be pollinated before becoming a seed. 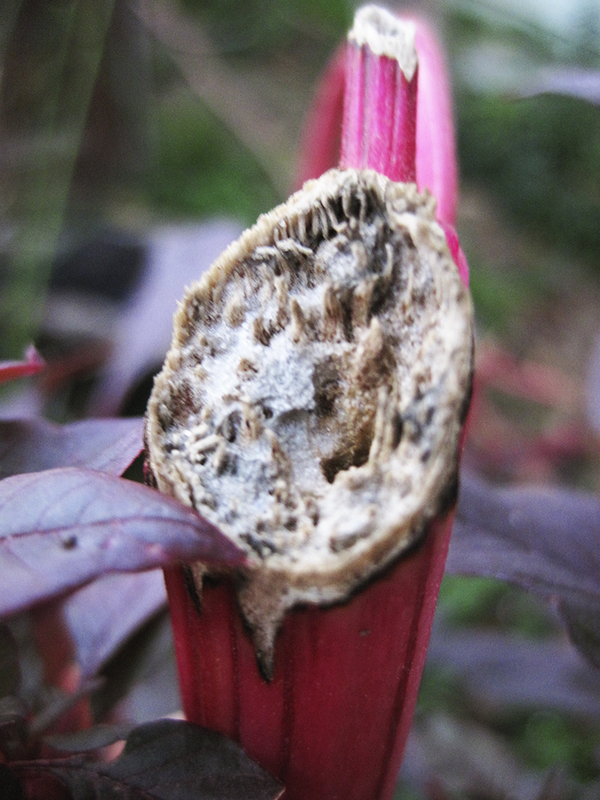 Amaranth stalks are filled with pith, a welcoming overwintering habitat for insects. 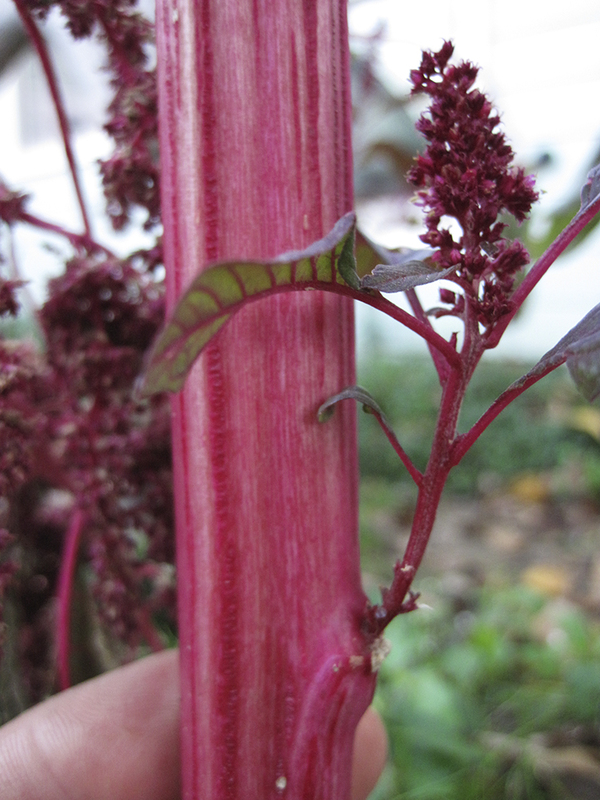 The substantial sturdy stems of amaranth can become so ridged and thick that an adult’s hand just reaches around it. Inside is a porous pith — perfect burrowing material for insects. At harvest time, don’t forget to leave some stalks in the garden to encourage wildlife to overwinter in your garden. 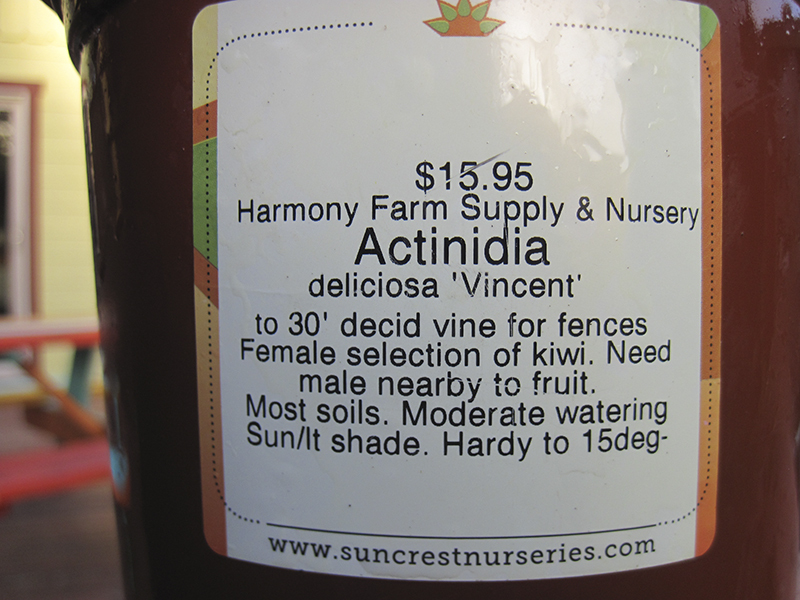 Besides, you will never get the last seed from the Medusa of flowers, but hungry songbirds might. 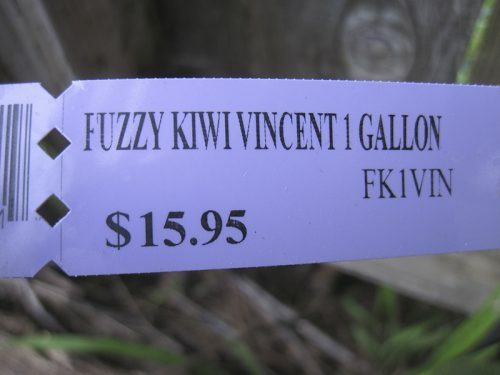 So leave harvested stalks in your garden. 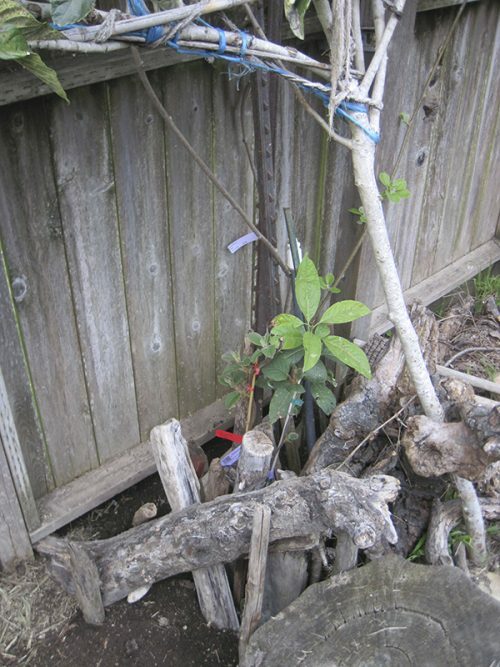 One person’s “debris” could be a whole ecosystem’s habitat. 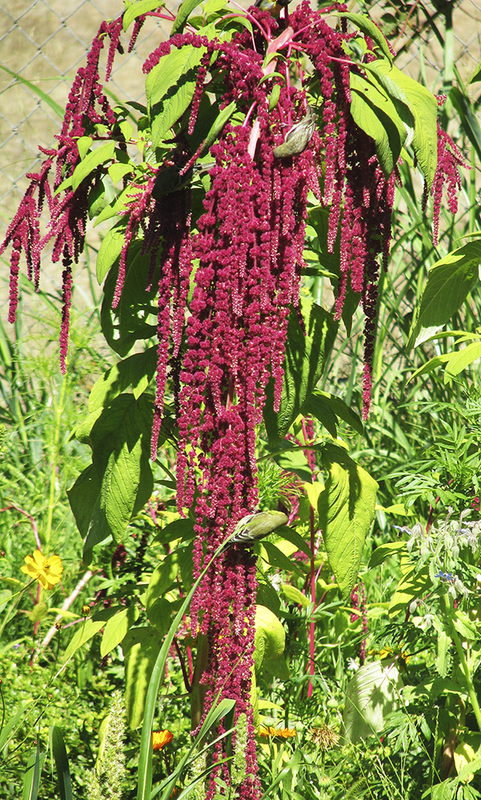 Birds feeding on Amaranthus caudatus. Photo credit: Diane Kennedy of Vegetariat (http://www.vegetariat.com). 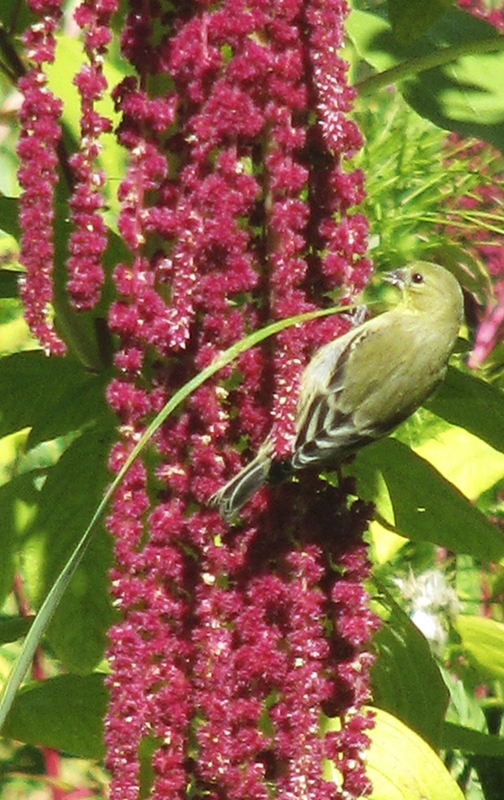 Bird feeding on Amaranthus caudatus. Photo credit: Diane Kennedy of Vegetariat (http://www.vegetariat.com). 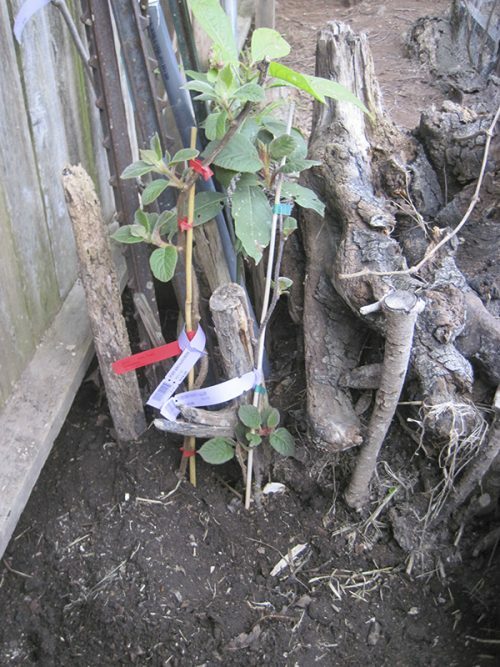 The advantages for including amaranth in my edible garden, which is within our “habitat food forest”, keep adding up. 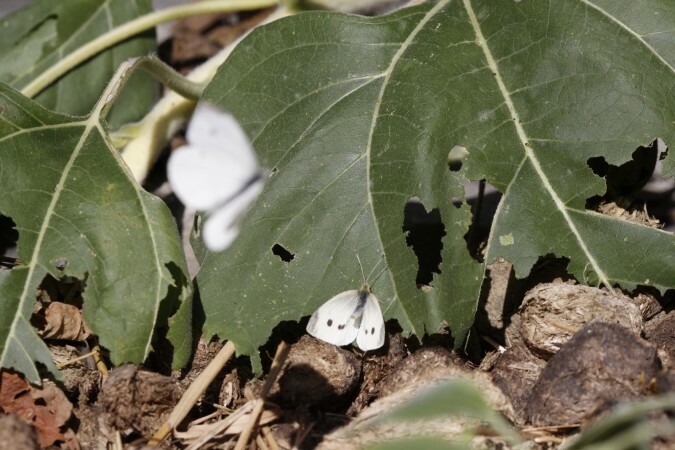 Buckwheat and amaranth pancakes for us, pollen and leafage for insects and small critters, seed for birds, a soil builder, and an overwintering material for insects and soil critters. 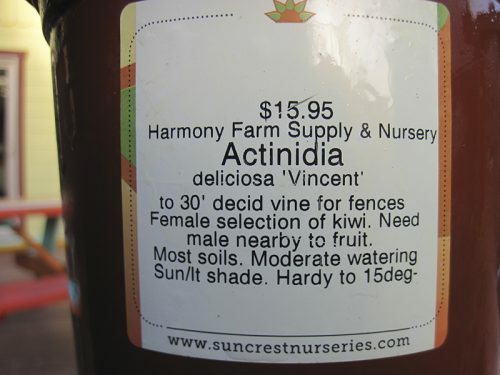 Enjoy your wildlife habitat garden! 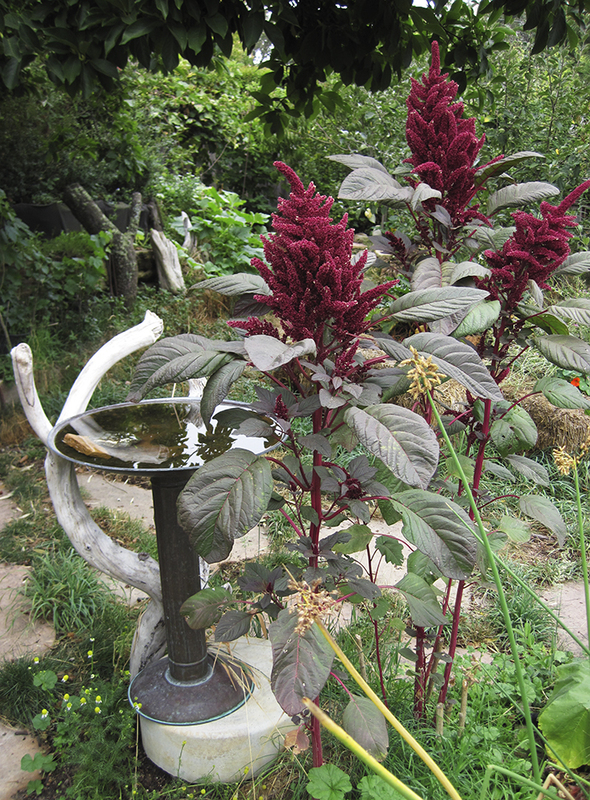 Amaranth caudatus growing alongside Bird Bath Beach in the author’s garden. 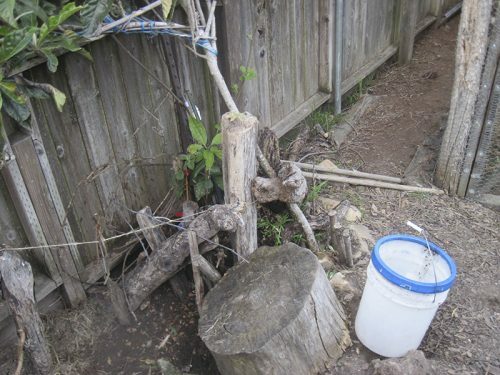 Note rocks in the bath — steps to the deep end for wasps, bees, butterflies, and birds. 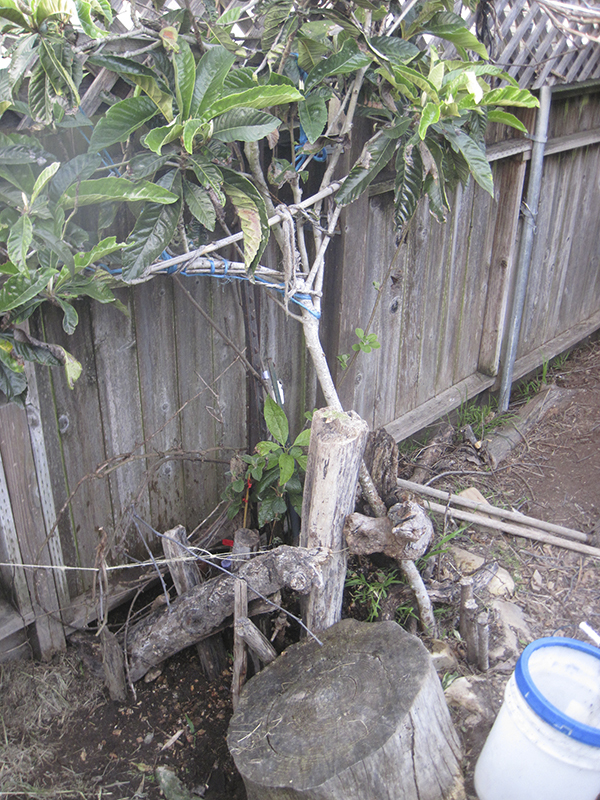 Also note the driftwood perches to allow birds to check for safety before committing to the water. The red pigment in amaranth was used by the Native American Hopi tribe to dye cloth. Amaranth seedlings (purple, back right) are tiny in relation to a sunflower seedling (green, with seed still attached). 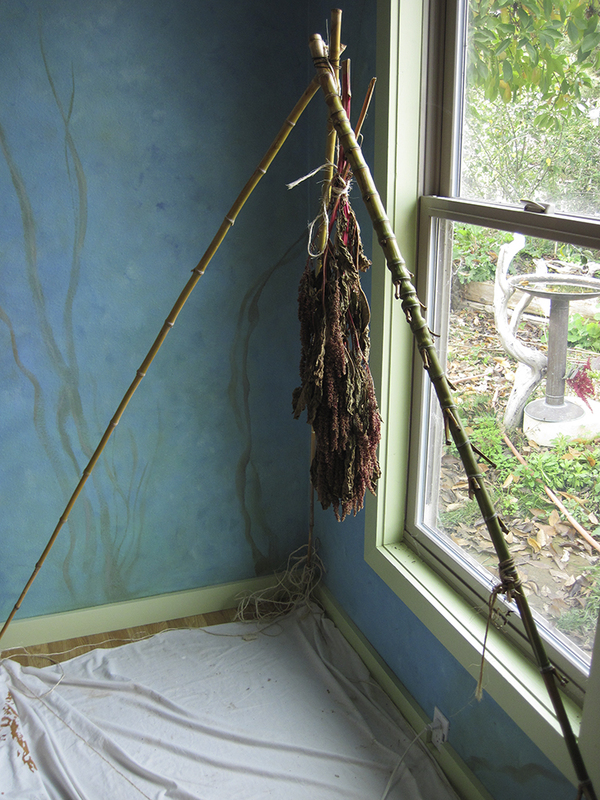 Drying stand for amaranth. 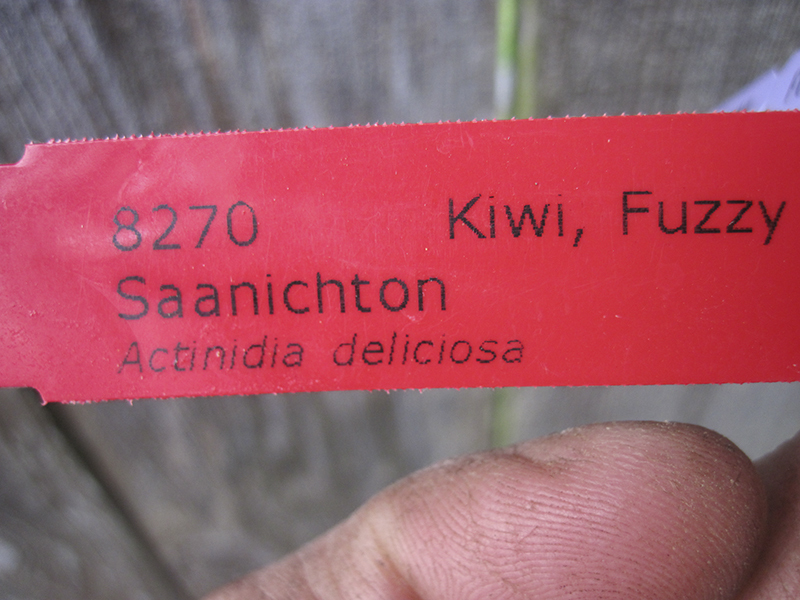 The flower clusters will be “milked” so that the seed will drop onto the sheet for easy collection. 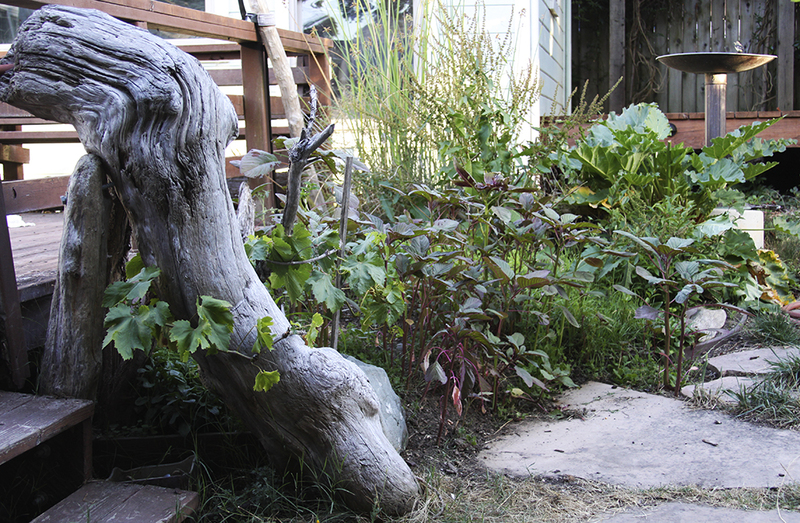 Twisty Toad Tunnel is a hugelkultur wildlife habitat in our Northern California garden. I severely pruned back a lichen-covered and overgrown tulip magnolia tree and stuffed the cut-down limbs, prunings, and cutting into The Bog — a hole in our garden where we make soil by winter and grow crops by summer. 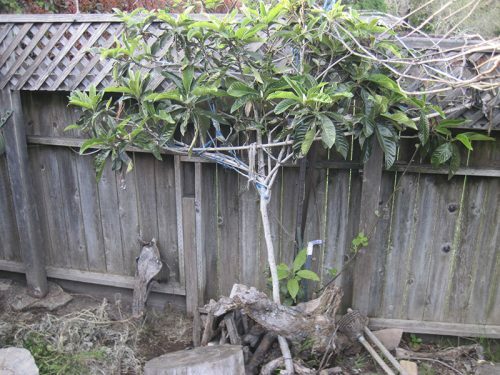 Much of the magnolia cuttings are elegantly draped with lichens, surely a beneficial source of wildlife shelter and food for animals microscopic to crawling to larger. The beginning of this post focuses on video installations of Twisty Toad Tunnel. The last paragraph provides you with a link to learn more about Twisty Toad Tunnels’ rich lichen contribution to out wildlife habitat hugelkultur. 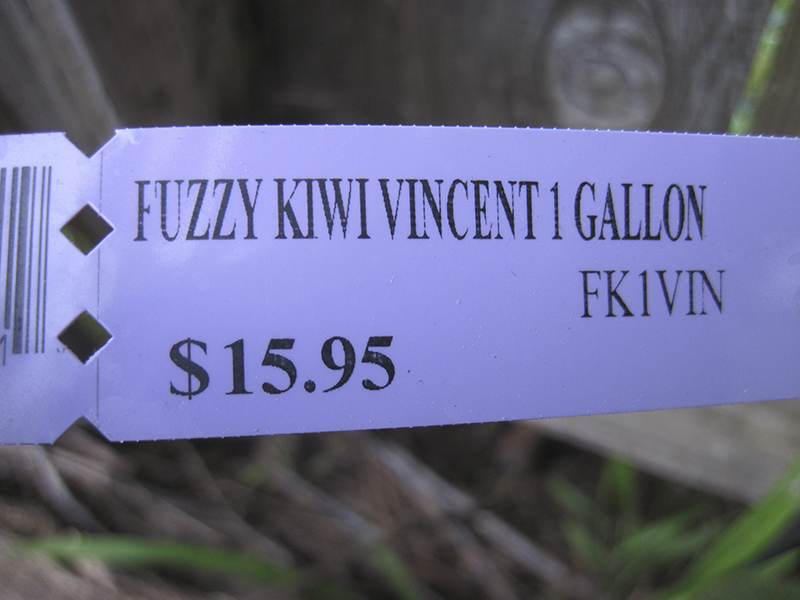 Today (the 14th) is my monthly blog post at Native Plants and Wildlife Gardens. This month, my blog article discusses how lichens support wildlife habitat in our residential gardens. Enjoy! And please comment me under my NP & WG article if you have any comments or questions. Earthworm Box surounded by leaf pile. 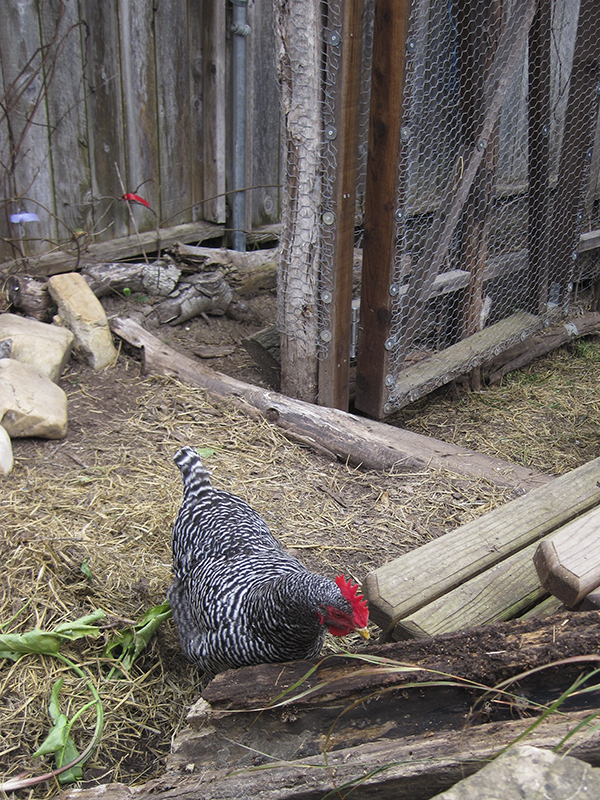 The organic leaf pile will help keep the Earthworm Box a few degrees warmer during the winter months. As I discuss in my monthly Native Plants and Wildlife Gardens blog article, “Over-Wintering Insects in Insulating Leaf Pile“, I wanted to insulate our earthworm boxes to take a little of this winter’s chill off the critters inside the boxes. 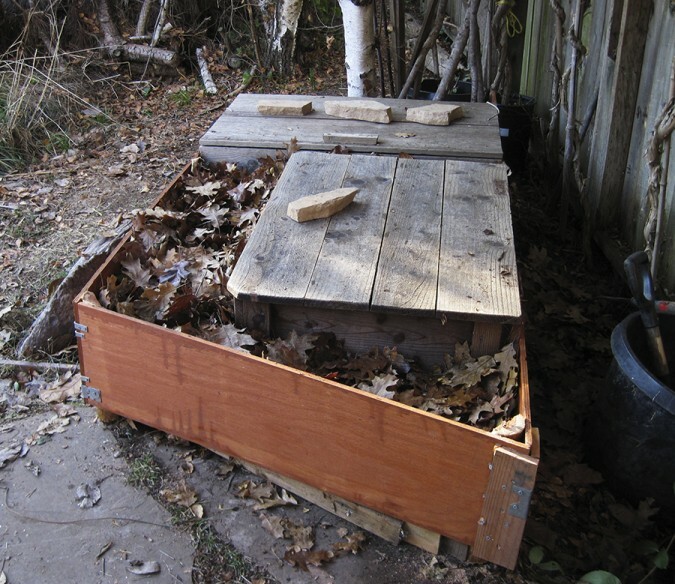 Surrounding the boxes with leaves accomplish 2 goals: 1) insulating the boxes to keep them warmer, and 2) provide more over-winter leaves to provide more wildlife habitat in our garden. Here are 4 videos of the project. Enjoy! An in-process video of the construction project. The frame is up; leaves are yet to be filled into the insulating spaces. A pile of leaves is worked into the insulating spaces alongside the earthworm boxes. 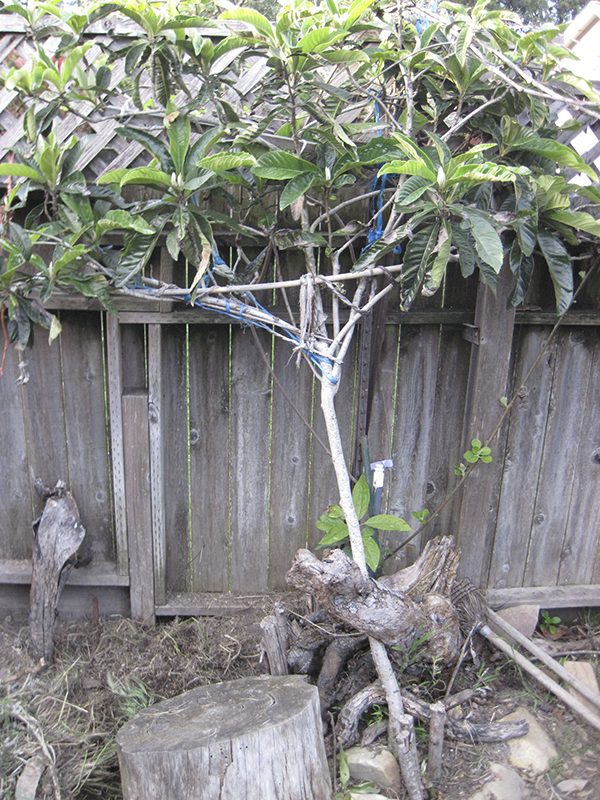 I have a paper to write, so I procrastinated in the garden. 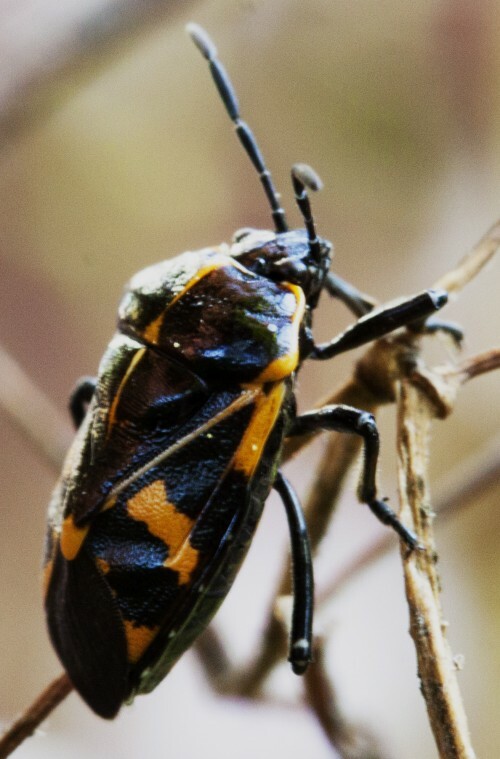 Was so fun meeting Harlequin Bug on a withered impatiens flower plant. Harlequin bug on impatiens flower stalk. Enjoy your garden. Habitat It! 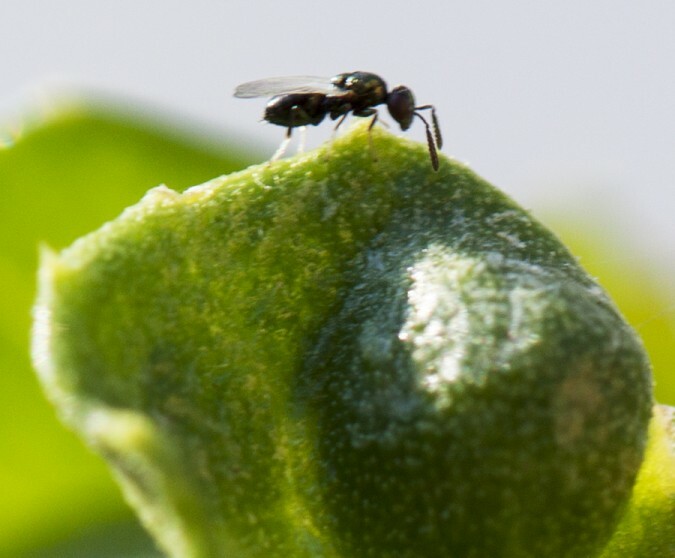 Through my Canon 50D and 180mm macro lens, I witnessed the following sequence of photos. A male checkered white, ID’d by the sparse dark spots versus the female’s abundance of brown outline and spots, is approached by another male checkered white. 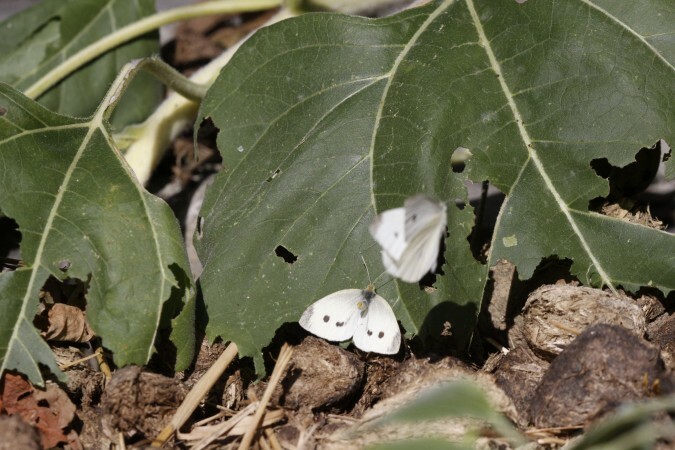 Note how the grounded butterfly’s abdomen is used to ward off the approaching male. 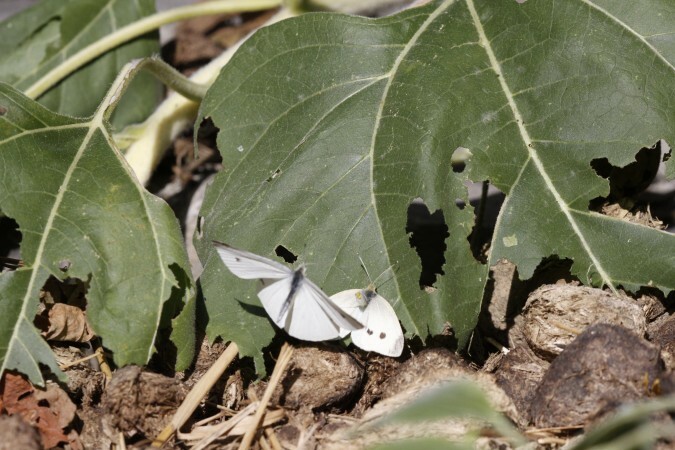 Male checkered white butterfly on sunflower leaf approached by another male. 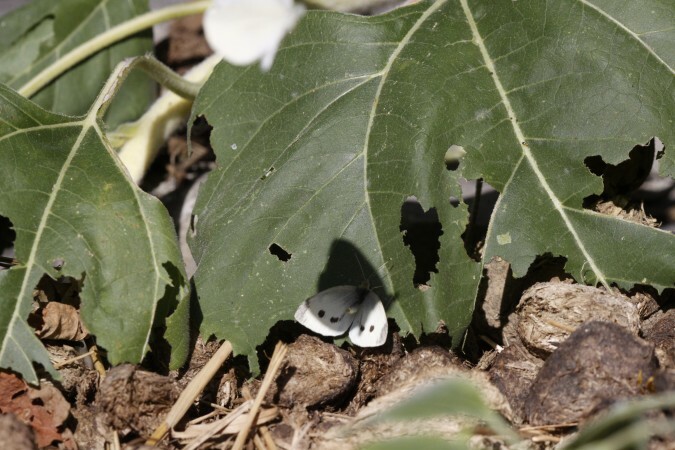 Male checkered white butterfly on sunflower leaf fending off another male. 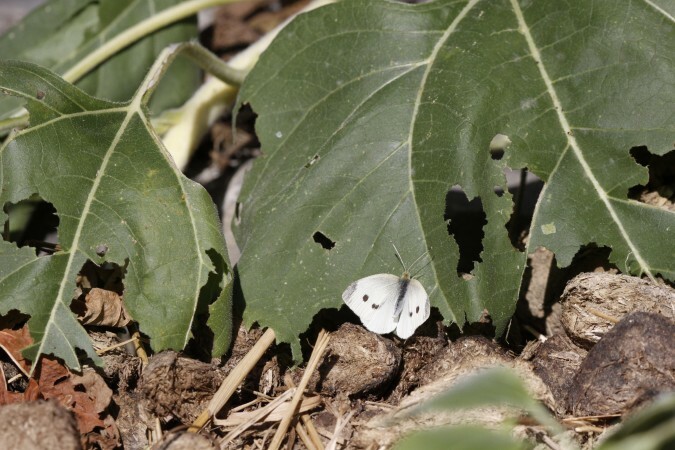 Male checkered white butterfly on sunflower leaf approached by another male checkered butterfly. Male checkered white butterfly on sunflower leaf successfully fends off another male. Male checkered white butterfly on sunflower leaf at rest, again. 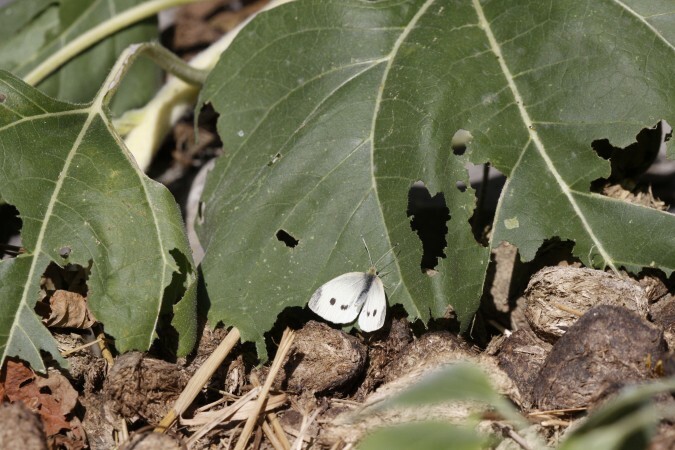 Enjoy your wildlife food forest garden. Habitat It! 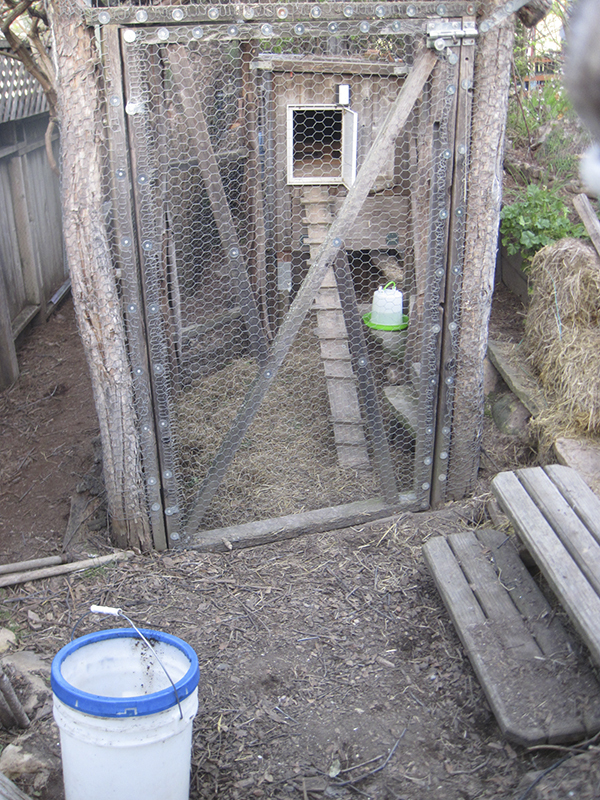 Cozy Cottage Egg Farm's 1st egg, layed by our Bard Rock hen, Marmalade. 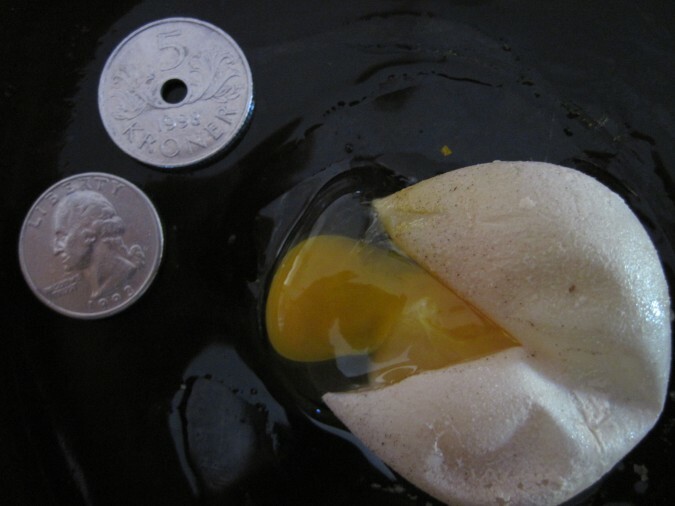 The coins are used for relative size: a Norwegian 5 kroner coin and a U.S. quarter (25 cents) coin. The eggshell was very thin and split open in the coop. Still yummy out of the fry pan! Cozy Cottage Egg Farm 1st egg was layed! 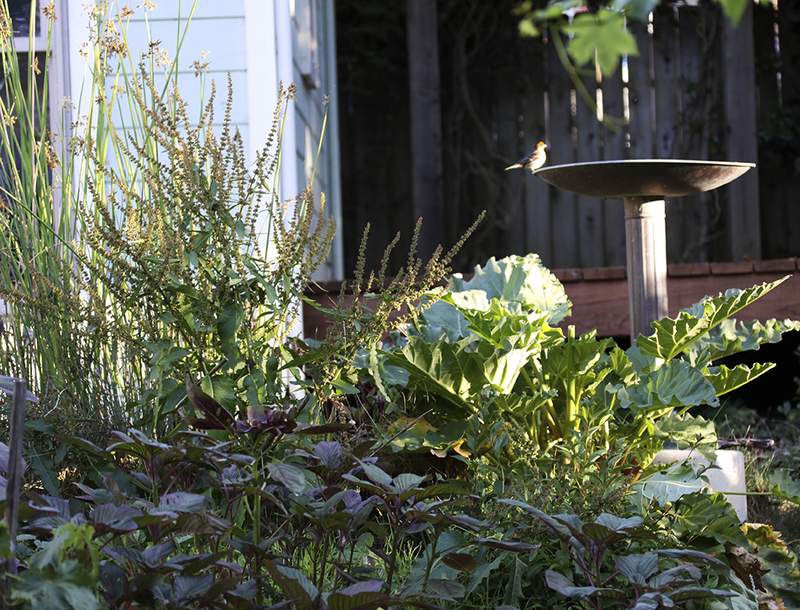 Enjoy your wildlife garden. Habitat It! 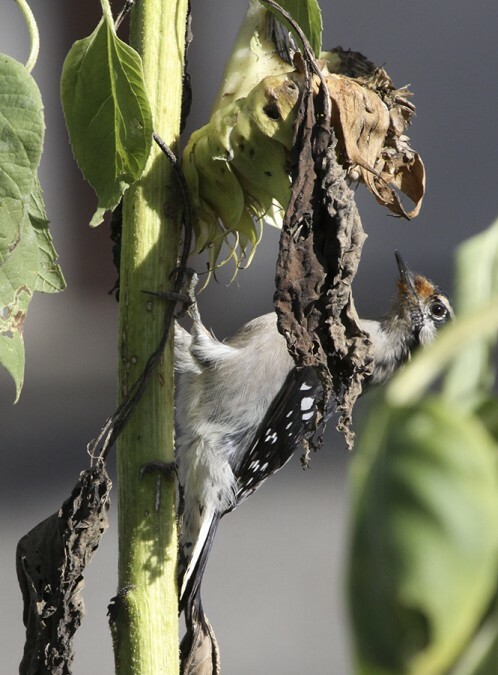 A Nuttalls woodpecker keeps a wary eye while feeding on a sunflower head. To see some videos of this project, click the video thumbnails.